Anatech Electronics, a manufacturer of RF and microwave filters, has published its first newsletter of the new year. 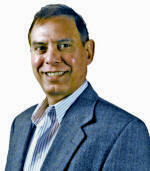 As always, it includes both company news and some tidbits about relevant industry happenings. In it, Sam Benzacar discusses, among other topics, the DoD's "onerous" task of dealing with the overwhelming number of potential interferers to its critical communications systems throughout the world. A significant source of interference is, ironically, the U.S. military itself, with its multitudinous transmitters across the entire EM spectrum. Anatech's business is to make certain that system and circuit designers have capable filters available to assure successful implementation. Like so things associated with "fields and waves", interference is a problem that often defies engineers' best efforts to eliminate it. Careful design and prudent use of filters can solve almost any interference issue, but sometimes this is just half the problem. The other half can be attempting to find out find out where it's coming from and convincing the person generating it that they ought to fix their equipment. However, if you think your interference issues are "the worst ever", consider the predicament of the Department of Defense. 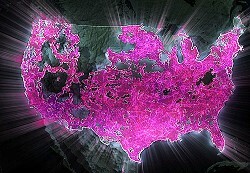 DoD has the onerous task of managing the spectrum it uses in thousands of sites in the U.S. and throughout the world. The Army, Air Force, Navy, and Marines must make sure their equipment doesn't interfere with equipment from friendly forces, refrain from interfering with licensed services that vary from country to country, and fend off attempts to jam signals by non-state actors and even individuals. This was always a problem, but it's getting much, much worse, as communication, encryption, and jamming technologies advance, and more adversaries use them. All this is occurring while DoD is attempting to better integrate the terrestrial and satellite communications, radar, and positioning, navigation, and timing systems used by its services to create a networked battlefield environment. In short, the interference challenges faced by DoD are arguably greater than any other organization in the world. However, as comic strip savant Pogo once eloquently stated, "we have met the enemy and he is us," which applies perfectly to Navy ships like Arleigh Burke destroyers. These impressive ships are jam-packed with emitters ranging from ELF to millimeter-wave frequencies along with radar and EW systems sometimes located only a few inches from each other. Combine this with the fixed wing, helicopter, and UAV aircraft on board and interference becomes a virtual certainty. When even a single system is updated, the change affects every other RF and microwave system on board. The problem is so severe that the Office of Naval Research created the high-level Integrated Topside (InTop) program with the goal of reducing the number of antennas to dramatically reduce the potential for interference. It's been supplemented by the Electromagnetic Command and Control (EMC2) program that expands this goal to ships, ground vehicles, and terrestrial sites. The program, which could ultimately reach $800 million over five years, teams 12 contractors with the task of allowing multiple services and operating frequencies to be accommodated using a single antenna. Both programs have formidable goals but no matter how successful they are, interference will still be a problem. Fortunately, it's a problem Anatech Electronics has been solving for more than 26 years in land, sea and airborne platforms with high-performance RF and microwave filter solutions customized to each application. So, if you're faced with an interference problem, we're here to help. Just give us a call at (973) 772-4242 or send us an email: sales@anatechelectornics.com. The Air Force is upgrading is upgrading the Joint Surveillance Target Attack Radar System (JSTARS) ground surveillance, battle management and command and control aircraft that tracks ground vehicles and aircraft, collects imagery, and relays tactical pictures to ground and air theater commanders. The upgrade program covers all elements of the system from the E-8C airframe based on the Boeing 707, to radar, communication systems, and the command and control suite. 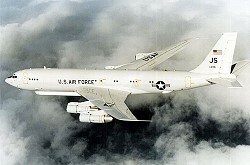 First launched during Operation Desert Storm in 1991, JSTARS includes the AN/SPY-7 synthetic aperture radar, 12 UHF radios, two HF radios, and three VHF radios, and various other sensors. T-Mobile says it's LTE network reached 313 million potential customers covered by the end of this year, up from 304 million in 2015. The company is using spectrum at 700 MHz it has periodically acquired for the build-out and is a participant in the impending FCC 600-MHz auction that should yield 84 MHz of available spectrum for cellular and $10 billion for the government. Like seemingly everyone these days, T-Mobile is working on 5G and has achieved download speeds of 979 Mb/s in the lab through three-carrier aggregation, 4x4 MIMO, and 256 QAM modulation. T-Mobile CTO Neville Ray says the company has already demonstrated 5G speeds of 1.8 Gb/s and an impressive latency of less than 2 ms using 8x8 MIMO. How Was Your Cellular Reception at CES? Visitors to the Consumer Electronics Show in Las Vegas this month should get better coverage in the convention center that is typically the case, thanks to a neutral-host distributed antenna system covering the 3 million square-foot facility. The system can simultaneously support more than 100,000 users, and all four major wireless carriers are supported. The system includes 38 indoor zones, six outdoor zones, and 52 remote locations. It uses more than 9 miles of coax, 4 miles of 144-strand, single-mode fiber, and 5 miles of 24-strand fiber, and has 295 MIMO antenna nodes and 42 equipment racks in the head end. 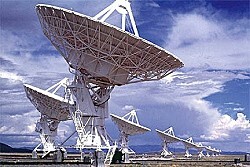 The search for extraterrestrial intelligence has been going on, fruitlessly, for decades and now an organization called Messaging Extra Terrestrial Intelligence (METI) based in San Francisco has taken up the cause. The team hopes to send either radio or optical signals to a planet that circles Proxima Centauri by the end of 2018. METI says its efforts will be the first to send signals repeatedly to the same places for years at a time, and is raising the $1 million a year it needs to pay staff and operate its facility. JQinetiQ says it is building "stealth" wind turbines that have a very small radar signature and plans to deploy 35 of the 400-ft.-high structures in southern France. The company claims they have a radar cross-section of only 4 ft., and the installation will become the country's largest wind farm. Wind turbines are a problem for radar systems as their blades tend to interfere with return signals from Doppler weather radars, which is why most of the larger wind farms are built offshore. The system is being built at the request of French power company EDF that failed to get the French government to approve an earlier proposal. To solve the problem, QinetiQ designed blades made from composite materials that absorb radar signals and radar-absorbing material cladding in the towers and generators.